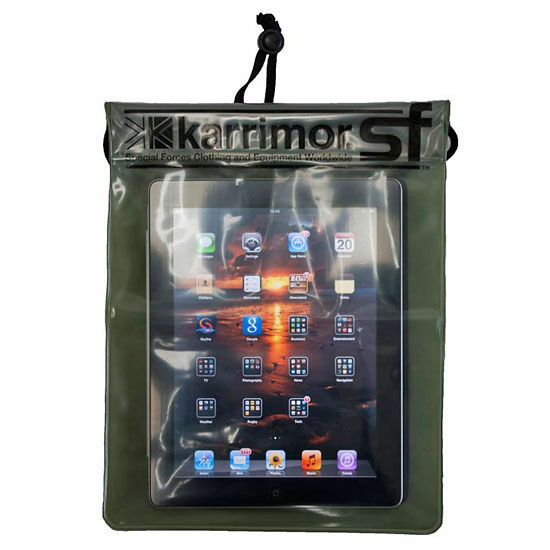 The Karrimor SF Waterproof Case is an ideal way to protect your iPad, maps or other valuables against the elements. Strong, welded seams and a waterproof closure ensure that your items stay dry in all conditions. The clear TPU material allows you to easily view maps or other paperwork stored within, while electronic touch-screen devices can still be used through the casing, even in the rain. This particular size is ideal for the Apple iPad and other tablet devices. Karrimor SF Waterproof Case - 25 x 35 cm is rated 5/5 based on 1 customer review. I take this on every trip to store valuables, documents, passports, keys, codes, phone etc. This size stores a considerable amount of stuff and having it all snugly in one tightly sealed place is invaluable. When not so full, you can easily fold it and wrap the cord around to save space. The seal and velcro is very strong.